Summary from Goodreads: PACK LIFE IS ABOUT ORDER, BUT BRYN IS ABOUT TO PUSH ALL THE LIMITS, WITH HAIR-RAISING RESULTS. At the age of four, Bryn watched a rabid werewolf brutally murder her parents. Alone in the world, she was rescued and taken in by Callum, the alpha of his pack. Now fifteen, Bryn's been raised as a human among werewolves, adhering to pack rule (mostly). Little fazes her. 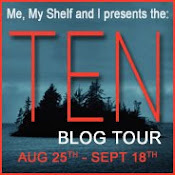 But the pack's been keeping a secret, and when Bryn goes exploring against Callum's orders, she finds Chase, a newly turned teen Were locked in a cage. Terrifying memories of the attack on her mom and dad come flooding back. Bryn needs answers, and she needs Chase to get them. Suddenly, all allegiances to the pack no longer matter. It's Bryn and Chase against the werewolf world, whatever the consequences. An exciting new paranormal adventure, with a heroine who rivals Buffy the Vampire Slayer, Raised By Wolves will leave you howling for more. I didn't realize how much I enjoyed reading books about weres, until I read Shiver last year. Now, books with weres are constantly on my TBR list. Raided by Wolves is another book featuring weres that looks very interesting. 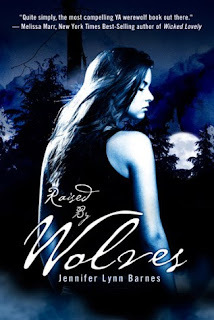 I have seen Raised by Wolves on a few other blogs and every time I read about it, I get more excited for it to be published. To learn more about Jennifer Lynn Barnes visit her website and blog. Yes, This one does sound good. Shiver definitely got me hooked on werewolves! I've never read a book about werewolves but this does sound exciting. This does look like a great book. I will have to add it to my TBR list. Good pick! I agree with you completely. Every review I see makes me even more anxious to get and read this book. I am starting to become afraid of disappointment. I have built this book up so much in my mind that I fear it can't live up to my expectations. OK I love the sound of this one. Always loved wolves. I will definitely be looking for this one for a summer read. Great choice! I want to read this one as well. Here'sMine. Great pick, I read about this one a few days ago! My WOW is at The Crowded Leaf. Just stopping by to leave you an award! Great pick! I like books with weres as well. :) Thanks for visiting my WOW! I am taking part in a tour for this one and I can't wait til its my turn to read it! Great choice! I haven't read many books with werewolves, but I have enjoyed them.